I guess with Bratislava we had no real preconceptions which is always a good thing, sure we had done some research on what to do and what to see, but unlike when you are heading to London, New York or Tokyo, we really wasn’t sure what we would find. We arrived under the cover of darkness as always and as such it’s hard to get to grips with your bearings. The area around where we stayed had been described as “old town” but at first felt quite harsh and ex soviet state. As the morning sun came and we explored further we found that the historical centre of the city was hidden behind the huge 1960’s shopping complex across the way from us, only a short walk from our front door! This would be the overall narrative for our time in Bratislava… a fascinating mix of the romantic cobbled streets and beautiful old architecture that characterises so many of the Eastern European cities we have fallen for, with the looming presence communist history casting a long and compelling shadow over this quaint but harsh city. Bratislava in one glance can look like Soviet Moscow at the height of the CCCP, massive obelisks pointing towards the air in celebration of the red army’s victory against the Nazi’s on the very soil we stand. The next we turn to see rows of modern condos and apartments clinging to the sun-drenched hillside as joggers pass by in a scene reminiscent of Beverly hills. A step in the other direction and we are back in gothic Europe, winding streets and baroque detailed buildings of all colours and fanciful shapes. It’s only the odd piece of graffiti that takes us back to the modern day and this mixing pot of culture, identity and layers of history. Bratislava, a city of many sides: It is both loud and under stated at the same time. People stepping off the bus in the centre for the first time could not fail to notice the gigantic UFO floating above the Danube in a typical soviet show of power. It’s in your face, it’s harsh, but turn around and perched on top of the hill is the white face of the ancient castle of Bratislava. Sitting by, witness to so much, waiting for your wandering eye to catch a glimpse of it’s majesty. The city is also surrounded by countryside and sits on an undulating landscape which gives it a somewhat rural atmosphere too. Standing on top of the famous UFO bridge you really get a sense of this, as you turn each direction affords a completely different view. Across to the narrow 18th century pastel streets of medieval old town to one side, the sprawling soviet housing projects across the river: Petržalka, one of the largest housing estates in Europe, then gazing down the river you see the amazing natural beauty which Slovakia is famed for. Not many people visit Bratislava, it sits on the Danube, dominated by the call of such classic beauties such a Budapest and Vienna, by the ringing of the bell of Krakow or Prague. Bratislava is a gem of the region hidden in plain sight, it’s lack of the surge of tourists the other cities receive is it’s charm, it’s authenticity and it’s character. We rooted for the underdog this time and it came out a champion! Self described at a “little big city” it is easily walkable and discoverable on foot. It is also so much quieter and calmer than many other capitals cities which makes it that much more peaceful to wander. The charm here is that around every corner you discover that understated magnificence which will leave you in no doubt that this is a wonderful city to visit. Remnants and evidence of passing empires have left their mark on this city, created it’s character and given it the diversity which makes it such a wonder to visit. Bratislava itself only got it’s present name 90 years ago having been known as “Pressburg” to the Germans and Pozsony to the Hungarians, but it’s true history dates back to the Celts , Roman settlers and of course the Slavs, the area has in fact been inhabited since around 500BC which makes it much older than the likes of Prague and Budapest! The city has since been shaped by it’s previously large Jewish population as well as the Austro-Hungarian nobilities who built some of the palaces and grand home which are a feature of the city. The castle itself tells the tales of the violent history of Bratislava, the fortification having been destroyed and rebuilt on numerous occasions including the infamous bombardment by Napoleon and his troops. Bratislava is also the only capital city in the world which borders two independent countries, it city limits stretch all the way to the borders with Austria to the west and Hungary to the south. We ventured out to the small town of Devin which lies right on the border with Austria to see the impressive ruins of the historic castle on the edge of the old iron curtain. Similarly to when we visited Budapest we decided to stay in an apartment in Bratislava. We love hostels (and the one we stayed in Krakow was amazing) but nothing quite beats the freedom of having a whole place to yourself. It does really make you feel much more connected to a city and having a kitchen comes it handy to for saving money too. The prices in Bratislava are not quite the same dirt cheap rates we found in Hungary and Poland but that is likely attributed to their inclusion in the Euro zone (the other’s having their own currency still). However we stayed in a great little place for roughly a week for around about £100 which was only a 5 minute walk from the centre of old town. Our host even picked us up from the airport and gave us a brief introduction to the city. You can find it under “Apartment Historical Centre”. For it’s size Bratislava has a massive network of public transport which include trams, buses and trolley buses. Many of which serve the outer reaches of the large metropolitan area of the city. In truth the city is very walkable and that’s part of what makes it so special, it has a human scale which allows you to interact with it on a personal level instead of constantly whizzing by half of it on metros and trams. The transport system however is quite easy to use with small ticket machines at most stops and also available to buy off the driver. 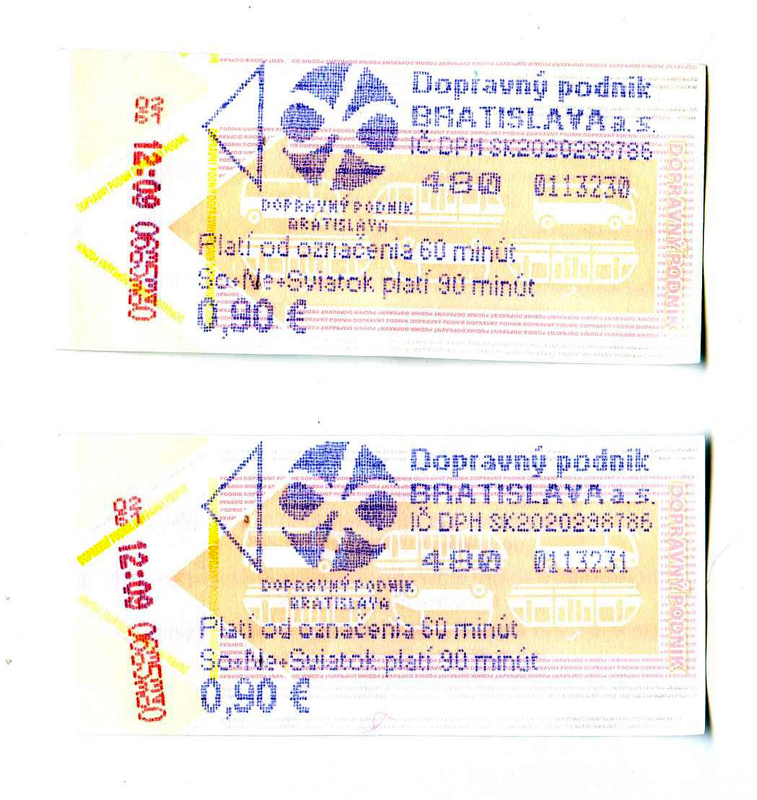 Tickets are purchased according to how long your trip will be and it really is quite cheap, for 60 mins a standard ticket is 0.90 Euros. You must stamp your ticket once on the bus or tram to begin your journey, if not the undercover conductors might have a nasty surprise for you! There are combination tickets available for tourists but it’s not really worth it given how much of the city you can see on foot. The airport is also quite close to the city centre and can be reached via public transport or private for around 20 Euros in around about 20 mins. The currency of Slovakia is the Euro, which I guess seemed a little strange give the fact it felt much more “Eastern European” than Czech Republic and they have their own currency. Personally I hate the Euro, it takes away part of the experience of using a new currency and it all becomes a bit homogenised. Not only that but countries in the Euro zone also tend to me more expensive than they would have been. Having said that Slovakia is still very cheap for Europe but no where near as cheap as many other Eastern European countries. Most people tend to speak quite good English, especially the younger people. The people are also very warm and welcoming which really helps when trying to find your way. Given it’s quietness we never felt pushed or pressured whilst wandering around the main squares as sometimes can be the case and always felt comfortable and at ease. It’s a simple enough concept but truely one of the most wonderful things to do in Bratislava is to just walk around the narrow streets of Old Town. In fact, before you do anything else just walk… you will soon find your bearings with the city being so compact and in doing so will come across some of that historic and rough charm the city is famed for. Be sure to visit Kapitulska Street! This church is one of the most beautiful and striking we have ever seen, not many churches are pained in this vivid sky blue pallet and it really stands out within the soviet era grey architecture of the surrounding streets. This gingerbread style church is actually not as only as you might imagine having been built between 1907-1908. Sitting on the outskirts of Old Town, but quite near to the new shopping mall and Danube promenade, it is definitely worth the trip. The surrounding area is also worth exploring for the many remaining communist era reliefs to discover. The main square of Bratislava is a hive of activity in this quiet city, here you will find rows of cafes and restaurants in which to sit back and soak in the 1000’s of years of history which has passed through this square before you. The area features many remaining medieval houses from ancient Hungarian noble families as well as the notable Notre Dame cloister and the Slovak National Theatre. The square has an air of grandeur about it which is only backed up by it being the location of the German and American embassies as well as the famed Carlton Hotel which once hosted Lajos Kossuth, King Franz Joseph and Albert Einstein. The swing set is also a fun place to people watch from!! One of the real gems of the city and a highlight of our visit. The town hall is a complex of buildings built over years of development and one of the oldest buildings in the city. The tower dates back to around 1370 and still has a Napoleonic cannon ball embedded in its wall from 1809! The building itself is a beautiful piece of architecture with sections in the Gothic and baroque styles alongside a Renaissance renovation, featuring a tiled roof with striking painted checked windows. Now-a-days the Town hall pays host to the Bratislava City Museum, founded in 1868 it contains some fascinating and priceless artefacts from the history of the city. The highlight however is the view from the tower itself, it allows a panoramic view of old town and beyond, the lines of tiled roof tops creating a scenic and romantic spot. Between the Main Square and The Primate’s square. It is next to the Jesuit Church. This impressive gateway is the only remaining entrance way of the old medieval fortifications of the city and is one of the oldest structures in Bratislava. St. Micheal’s gate also has to be one of the most beautiful features of the city and can be seen towering over the rest of the buildings from a far. The tower now hosts the Museum of weapons and also tell of the history of the cities fortifications. The last remaining stretch of the Bratislava moat can also be accessed here having now been turning into a park below Micheal’s bridge. The 279ft spire of this grand old church dominates the skyline of the city, it is an important place of worship for the city having been the coronation church of the Kingdom of Hungary between 1563 and 1830. However the inside of the church we felt was slightly underwhelming compared to the stunning exterior and is maybe worth a short pop in given it’s historical significance. Mon – Sat 9:00 – 11:00, 13:00 – 16:00.
located in the centre of Old Town it is considered one the most beautiful building in Bratislava with it’s pastel pink exterior and exquisitely lavish interior! This neoclassical palace was built between 1778 and 1781 and is home to the impressive “Hall of Mirrors” in which the War of the Third Coalition was ended my the signing of fourth Peace of Pressburg. One of our favourite spots in the city the Slavin memorial is a little bit of a walk from the centre and mostly uphill but is well worth the effort. The memorial is a massive soviet obelisk and war cemetery for thousands of Russian soldiers who died liberating the city from the Germans in April 1945. The Stalinist era style really does make you feel as though you are stepping back in time and into the USSR. The views of the city from here are also magnificent and give you another angle from it’s other vantage points. It’s also up here which the contrasting sides of Bratislava can be seen at their most prominent, just next to the monument is a rich villa quarter reminiscent of the Hollywood hills! A bus number 147 stops right under the stairs, which lead to the monument. However, if you continue walking from the Grassalkovich Palace you will see a set of steep steps, follow those and you will be able to see the monument. This massive rectangular castle sits high above the city on the little Carpathians and can been see far away even over the border in Austria. Again it offers great views of the city from it’s vantage point which I believe is actually higher than the UFO bridge. The castles history is long and complicated! Having been destroyed and left to ruin several times since the original buildings were constructed in the 9th century and having major renovations in the 1950’s as well as in 2011. The castle is now primarily a museum and can be accessed from three impressive gates: The Sigmund gate, Vienna gate and the Nicholas gate. We found the building and the view itself to be worth the hike up the hill! One of the best things to do in the city by far, the bridge is something the locals love to hate and whatever you think about it there is no mistaking it. The soviet monstrosity sits proudly above the Danube as the longest cable-stayed bridge to have one pylon in the world. The 278ft “UFO” can be accessed for under 10 euros and houses a restaurant, observation deck and toilets with full length windows!! The view from here is nothing short of spectacular, you can see for miles and it really demonstrates the different sides to this city, the old, new and natural! We sat in the bar over looking the city for a couple of drinks after our visit to the top deck which was a slightly unnerving experience given the amount the “spaceship” shakes with the traffic below! The closet tram and bus station are located just about 3-5 minutes by walk from tower and is called “Nový most”. Ok, so this is a bit of a joke but as most of the comments I got on my facebook page seemed to mention this film upon my arrival in Bratislava I thought it was worth highlighting how the region is often portrayed in the media. I must admit before heading to Eastern Europe for the first time I was a little apprehensive, but I’m talking back when I was a naive teenager who had watched way to many horror movies. But I know many of my family members still ask if we are scared before heading out to these counties, which is ludicrous! Especially given that just last week a man was killed in the centre of the town we are from. So. Have you ever been to Bratislava, what did you think? After publishing this post we were invited to do an interview with “The Journey Journal” about the misconceptions of Eastern Europe and Slovakia in particular. Bookmark this article A guide to charming and contrasting BRATISLAVA, Slovakia. This is really a wonderful city to visit. Great! It’s a lovely little place with such character. Your post confirmed my decision to go! So helpful thank you. We are going in winter so guess it will be cold and snowy, but lots to do inside. Thank you! have a great time, I am sure it will be beautiful in the snow! I love this post. and whats more , it is right on time for our trip to Bratislava in August this year. I do hope that’s a good time of the year to visit. We would also wan to go out of Bratislava. Any suggestions? We didn’t really see much more of the country and would love to return. But Devin castle and Vienna are great day trips out of the city.